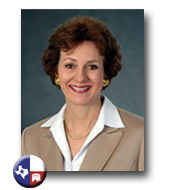 Susan Combs has been Texas Comptroller of Public Accounts since she was elected in November 2006. As Texas Comptroller, she has worked hard set an innovative course of action to transform state government and prepare Texas for the future. Combs manages the state’s treasury operations, monitors Texas’ fiscal health, guides legislative decision makers by estimating state revenues and ensures state taxes are collected fairly and efficiently to fund vital programs and services for the people of Texas. Combs advocates that the government must be fully accountable to the people it serves and has been the driving force behind giving taxpayers a clear view at exactly how their dollars are being spent. She also introduced Open Book Texas, a set of initiatives aimed at improving government accounting accuracy, spending, and transparency. Combs' vision for the future drives the efforts of the Comptroller’s office in supporting a prosperous Texas. Susan Combs' was born in San Antonio and has a ranching operation in Brewster County on the same ranch owned by her great-grandfather more than a century ago. She currently lives in Austin with her husband and three sons. You can also follow Susan Combs on Twitter.